At APQC we talk to KM leaders who are doing great things to focus their programs, improve knowledge sharing and reuse, and motivate people to participate. 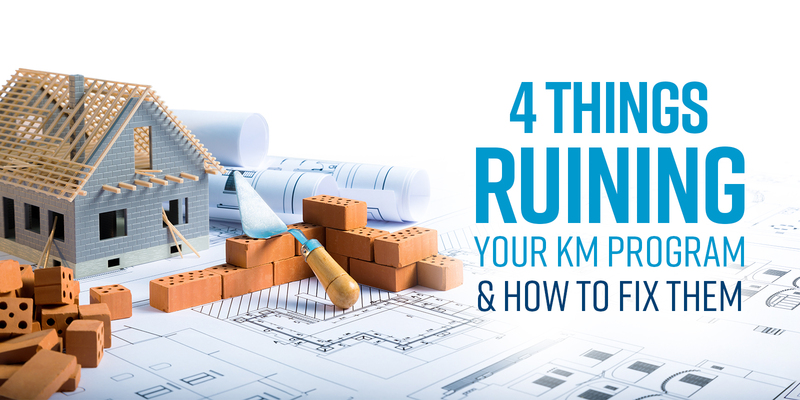 But we also meet KM professionals who are making big—and avoidable—mistakes. 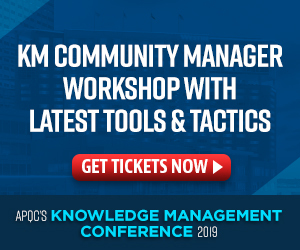 Earlier this year, I sat down with veteran community manager, author, and speaker Stan Garfield to talk about the missteps organizations make in KM and how to avoid them. He zeroed in on five common blunders. #1 Failing to start with a compelling vision. One of the biggest mistakes Stan has observed is failing to articulate a clear and compelling vision for what KM should be, what it is supposed to achieve, or how success will be defined. This type of vision functions as a mission statement to drive KM forward and prevent the focus from drifting. The KM team can also use the vision to explain what KM’s all about and get people excited. The second mistake Stan emphasized is failing to put a good information architecture in place. While information architecture isn’t a new concept, it is frequently overlooked, he said. Many organizations limp along maintaining legacy systems without taking a step back to assess the overall design, how it fits together, and whether more fundamental changes might serve everyone in the long run. Stan recommended inviting a respected information architect to perform an audit of your current architecture, the usability of your systems, and the findability of your content. Then you can make improvements based on the analysis. “It’s very helpful to get that fresh perspective. They may endorse what you’re doing, and that’s great! But they may point out what you’re missing.” And those recommendations are particularly valuable because they come from an outsider who isn’t wedded to past processes or how the infrastructure developed. Another missed opportunity that Stan talked about relates to content curation. When people complain that they can’t find the information they need, knowledge managers may invest in new search engines or search tuning —and both can be valuable. But there are also simple, non-technological solutions to make high-traffic information easier to locate. Stan suggested that KM teams identify the most commonly looked-for pieces of information, either across the organization or within a particular area, and then make sure those 50 or 100 items are up to date and readily available through a central, easy-to-access interface. This might involve creating links or relocating content to a particular repository. Either way, people won’t have to struggle through bad search results when they need in-demand information. Stan mentioned how much effort organizations spend changing apps and platforms every time a new version is released. Sometimes vendors require these updates, but in other cases it makes more sense for the KM team to invest their time elsewhere. Updating tools and migrating content requires a lot of resources, and in some cases, the new versions don’t provide significantly more value than the old ones. The final mistake that Stan talked about was the impulse to chase every fad that comes along, regardless of whether new technologies and techniques have been proven or are relevant to the KM business case. This kind of behavior is most common in organizations that lack a compelling vision and use cases for KM. “They’re trying to figure out what other people are doing and mimic that, rather than figuring out what’s best for their needs,” he said. Listen to my full conversation with Stan Garfield in the podcast below. You can also hear more from both of us at APQC’s 2019 KM Conference, taking place April 29 – May 3 in Houston.